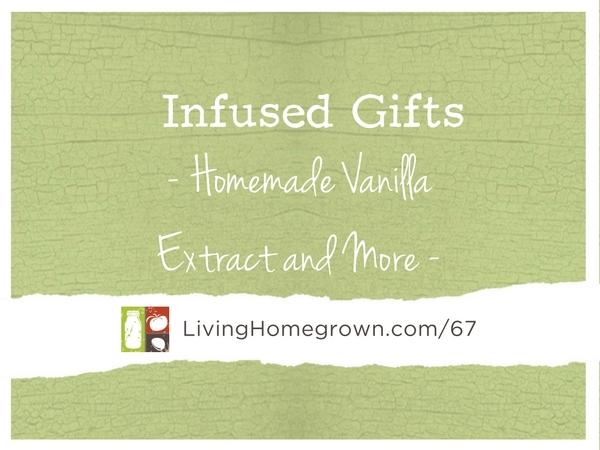 This episode is about making infused gifts to give away at the holidays. These are all simple recipes that do not take much effort. However, infusing does take a little bit of time because the flavorings must sit for a while. So be sure to start these infusions as soon as possible. That way, you will have several nice gifts ready at holiday time. As a bonus, there is a PDF below for creating a simple cranberry liqueur as well. But it also lovely to make a festive cranberry liqueur using fresh or frozen cranberries. What I like about this liqueur recipe is that you can make it the traditional way (using a granulated sugar syrup). Or you can make a tart (unsweetened liqueur) to use in mixed drinks. Or you can sweet the liqueur with apple juice and avoid the granulated sugar completely. When bottling up your creations, you need to pour the finished alcohol infusions into clean bottles that have been washed with hot, soapy water. You do not have to “sterilize” the bottles by boiling for 10 minutes because the alcohol is a pretty good preservative. But you certainly can boil the bottles if you want to. You can also run your bottles through the dishwasher. I listened to the Podcast about making homemade vanilla extract. That was the piece I was most interested in. I went to Livinghomegrown.com/67 looking for the recipe for this. I do not find the recipe there. I see the transcript of the broadcast, the recipe for Cranberry Liquor. Can you help me find this recipe. How do I get just the recipe to make vanilla. Hi! I know this comment is late but I wanted to let you know that I made the Cranberry Liquor for the Christmas holidays and it was delicious. The color was also gorgeous. I didn’t sweeten it and mixed it with ginger ale. Also mixed it with plain seltzer water and it was good that way, too. Fantastic Colette! Thanks for the feedback! I bet the color was awesome.